Steve Saleen as his name back and to kick off the 2014 model year for the mighty Saleen Mustang, there are a total of five new Saleen packages that range in output from 440 to 700 horsepower with prices ranging from $39,095 to $82,634 – a spread in price and power that can appeal to a huge range of buyers. The new Saleen Mustang lineup is available in five color coordinated package ranging from the “entry level” 440 horsepower White Label to the 700 horsepower 351 Extreme Black Label. In the middle sits the Yellow Label Saleen Mustang with 625 horsepower, followed by the 440hp 302 Black Label and the 625hp 302 SSC Black Label packages. The “base model” 2014 Saleen Mustang White Label is powered by the same 5.0L V8 as the current Mustang GT but thanks to 39lb fuel injectors, a high performance air intake, a high performance exhaust system with high flow mufflers and a high performance engine calibration this 302 cubic inch V8 packs 440 horsepower and 400lb-ft of torque. This drivetrain is finished off by a standard 6-speed manual transmission (6-speed automatic is optional) with 3.55 gears. Improving the handling of the Saleen Mustang White Label is a Saleen S4 suspension package with special springs, bushings and links, a strut tower brace, strut tower brace plates and 5 spoke 20” alloy wheels wrapped in high performance rubber. In terms of appearance, the 2014 Saleen Mustang White Label wears a unique front blade grille, a deck lid insert, a high downforce rear wing, stripes on the front fenders, Saleen logos around the exterior and the familiar Saleen serialized front and rear bumper numbers. The White Label Saleen Mustang is available in 9 colors - Red Candy Metallic Tinted Clear Coat, Grabber Blue, Ingot Silver Metallic, Performance White, Race Red, Deep Impact Blue Metallic, Ebony, Grey Metallic, and Gotta Have It Green Metallic Tri-Coat. On the inside, the Saleen White Label features embroidered Saleen logo headrests, a leather wrapped shift knob, a Saleen gauge cluster, a serializes dash plaque, a leather wrapped steering wheel wearing a Saleen badge and a chrome key fob. The next step up for the new Saleen Mustang is the Yellow Label, which packs the same 5.0L V8 and many of the same upgrades as the White Label but the Yellow Label package adds an intercooled supercharger setup and an improved cold air intake package to raise the engine output to a whopping 625 horsepower and 536lb-ft of torque. The Saleen Mustang Yellow Label channels all of that power to the rear wheels via a 6-speed TR3650 manual transmission and 3.55 gears while the same 5-spoke Saleen rims and high performance tires help make the most of that power. While the interior and exterior appointments are more or less identical to the White Label save some package specific badging, the suspension package of the Saleen Yellow Label Mustang is improved a bit to handle the extra power. Saleen S4 front and rear springs that have been optimized specifically for the 625hp Mustang combine with the unique front struts, rear shocks and both front and rear sway bars to allow this package to offer better handling than the base model White Label. The Yellow Label is also available in the same nine colors as the White Label. 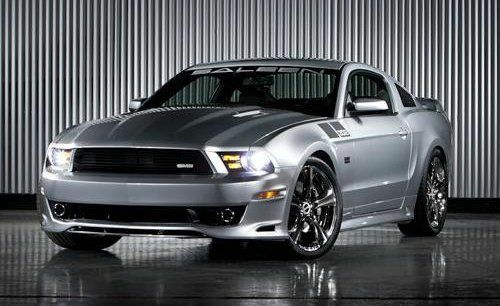 The 2014 Saleen Mustang 302 Black Label is similar in its drivetrain design to the Mustang White Label with 440 horsepower while packing a similar suspension, tire and wheel setup to the Mustang Yellow Label. Buyers can opt for a big brake setup with 14 inch front rotors and 4-piston power coated calipers. Where the 302 Black Label differs from the White and Yellow packages is in the exterior design, where Saleen adds a special front fascia with a unique hood, a high volume radiator intake opening and integrated brake vents, the Saleen blade front grille, a front splitter with heat exchanger intake openings, deeper side skirts with integrated brake cooling ducts, quarter window trim, a deck kid center insert, a rear fascia with exhaust vents, a high downforce rear diffuser and a high downforce rear wing. The exterior also features the special badging of the lower priced models along with the Saleen bumper numbers. Inside, the Saleen Mustang 302 Black Label features two tone leather and Alcantara seats, a leather wrapped shift knob and boot, an Alcantara wrapped steering wheel, a 200 mile per hour gauge cluster, Saleen door sill plates, a Saleen steering wheel logo, embroidered floormats and a serialized Black Label dash plaque – with Steve Saleen’s autograph on the dash. Finally, the 2014 Saleen Mustang 302 Black Label offers 21 different exterior hues - Red Candy Metallic Tinted Clear Coat, Grabber Blue, Ingot Silver Metallic, Performance White, Race Red, Deep Impact Blue Metallic, Black, Sterling Grey Metallic, Gotta Have It Green Metallic, Plum Insane Metallic, Burnout Black Pearl, Tire Smoke White Pearl, Lizstick Red Metallic, Sour Apple Green Metallic, Orange County Orange Metallic, Maliblue Metallic, Pineapple Express Yellow Metallic, Shark Skin Metallic, Beryllium Copper Metallic, Molly Pop Pink Metallic, and ChromeMolly Metallic. The next step in the 2014 Saleen Mustang lineup is the 302 SSC Black Label which is essentially the drivetrain and suspension components of the Yellow Label combined with the interior and exterior features of the 302 Black Label. The price of the 302 SSC Black Label package is not available in the Saleen website but when you consider the $10k difference between the White Label and Yellow Label, the 302 SSC Black Label will probably at least be in the low $60k range. Last but most certainly not least is the 2014 Saleen 351 Extreme Black Label which departs from the 302 cubic inch V8 to make room for the 351 cubic inch V8 that packs an intercooled Saleen supercharger package and a long list of supporting mods to offer 700 horsepower 655lb-ft of torque. In addition to the high performance engine package, the 351 Extreme Black Label features similar interior and exterior upgrades to those found on the other two Black Label Mustangs along with a similar high performance suspension package while the optional 14” braking package comes standard.